Even in my pre-vegetarian days, I was never a huge fan of meatloaf. Seriously - a loaf? Of meat? No thank you. And because I've never liked meatloaf, I was never interested in the vegetarian alternatives - wheatloaf, neatloaf, and whatever other cutesy names I came across in my cookbooks. 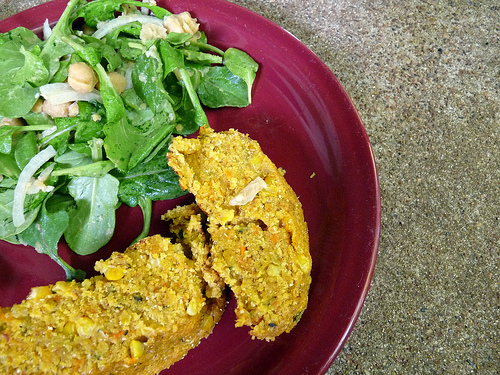 I stuck to stir fries and casseroles and veggie burgers, and I was happy. So why a vegetarian loaf now? Because I'm bored. I eat a stir fry every week. It's way too hot to eat a casserole. Salad is growing on me, but I can't consider salad alone a meal. And so, in an effort to expand my cooking horizons, I was browsing through Mark Bittman's How to Cook Everything Vegetarian (which is huge and wonderful and also slightly intimidating) when I came across the section on veggie burgers. That's right. This loaf is actually a veggie burger recipe - in the little box next to the directions, he listed the loaf as an option. And for some reason, it sounded like the right option for dinner. I ended up making a ton of changes to the original recipe - I added more veggies than he called for because I had them, my food processor broke so I grated everything instead of pureeing it, and I subbed vital wheat gluten for the binding agent (Mark recommended flour; I think a little gluten goes a longer way). In the end, I liked my version a lot. 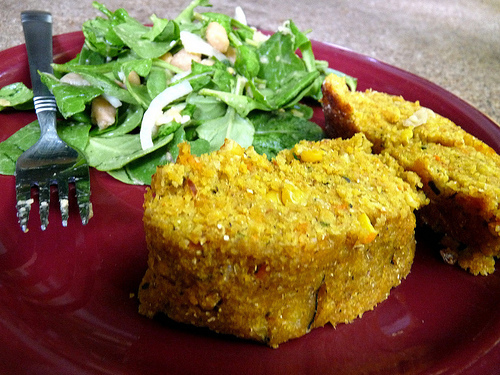 The cornmeal gave it a pleasant crunch (Nathan said it reminded him of polenta) and the mix of summer vegetables was perfect. It was a little on the dry side, but I think next time I'll top it with a light miso gravy. And believe me - there will be a next time. Heat the oil in a large pan. In a large bowl, combine the zucchini, squash, carrot, onion, corn and garlic. Saute for 10 minutes, until the veggies dry out and the moisture evaporates. Remove from heat, cover with a lid and let rest for ten minutes. While it's resting, preheat your oven to 350F. Add the cornmeal and stir in the pan to coat everything. Add the gluten and knead with a wooden spoon (the mixture will be too hot to knead with your hands) until it binds and resembles a ball of dough. Shape into a loaf and place in a greased loaf pan. Cover the pan tightly with aluminum foil. Bake for 30 minutes and then remove the foil and bake for another 20-30 minutes, until the top is browned and crusty. Remove from the oven and let cool for ten minutes before slicing and serving.